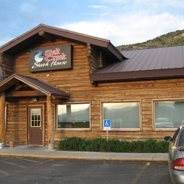 With a capacity of 400, our large log lodge style building is sure to exceed your expectations. With an impecable sound system & accoustics, as well as a variety of seating on two levels and large stage & dance floor, you are sure to have room to enjoy yourself. See our events page for exciting shows, concerts and much more , please contact us with any requests or suggestions you may have on events to bring in, pleasing our customers is our number one priority! For travelers or those coming from further distances for a weekend of fun, we also have an RV park on site, please visit our RV Park Tab for more information.